Robot.txt is a way to tell search engines whether they are allow to index a page in the search result or not. The bots are automatic, and before they could access your site, they check the Robot.txt file to make sure whether they are allowed to crawl this page or not. Sometime, people do not want to stop searching engine from crawling their whole website. On the other hand, they want to specify few pages, which should not be indexed in the search results. Therefore, today in this article, we will show you How to Enable Custom Robot.txt File in Blogger? First of all, go to Blogger.com >> your site >> Settings >> Search engine Preference >> Crawlers and indexing. Now you will be able to see two options i.e. Custom robots.txt and Custom robots header tags. These two options would provide you the flexibility to customize your robot.txt file. 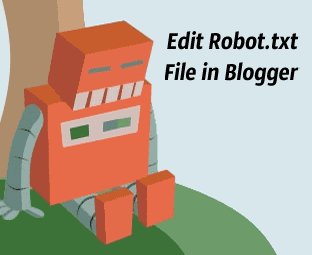 Custom robots.txt: This option provides you the ability to edit your whole robot.txt file. You can just type your content whether you want the content to be crawled by spiders or not. However, You can always undo your actions and can always revert back to normal. Custom robots header tags: This option is a bit completed. It does not provide you the ability to write your codes instead it provides few options with the check boxes. So, if have no idea about head tags then stay away from it. Now you have to enable the custom robot.txt file so press the edit button which is present next to the “Custom robots.txt” option. After selecting the edit button, it would ask you to enable custom robots.txt content so press “Yes” and proceed to the next step. In the text area, type the content which you want to exclude from being crawled. After editing the file according to your needs, press the save button to conclude. However, if you want to revert back to the default robot file then, you can select “No” instead of “Yes. We hope this tip would help you. If you are having any issue regarding crawling then, feel free to leave your questions in the comments below and our experts would try to help you in solving them. Thanks Syed Bro well explanations. We will just only write the name of page like About me. We have to write full url of that page and put it here. How? No, you have to write the URL. For example, if your want to stop robots from crawling this URL (www.mybloggerlab.com/p/about.html) then, in the robot.txt file you will enter this command. Exclude the main domain and just type the remaining part of it. We will create a separate article to explain the commands which we use in robot.txt file. Hi,previous when i publish a post i could see it in google search results in a few minutes,it was gettting indexed automatically .But now donno what happened,i dont see my published post in google even after a day,and if I manually submit my blog post to google ,it is getting indexed.Pease let me know what would the problem. It is not only you who is facing this issue. Almost the majority of BlogSpot blogs are getting index lately. So don't get dishearten and hope of the best. You have to include this as disallow condition. Syed i have insert my robot.txt file in blogger dashboard in crawling section like this is it OK.
hey please tell me if i want all my pages and posts being crawled by search engines then what would be the code??? i am using this one...please tell me is this right??? hey please help me i have a problem with my blog. when i search my url in search engines then the description of all posts appears to be same there is nothing related to my post in its description. what should i do now???? You should add Description specially while publishing a post. Its better to it manually. This is a Default Robot file so its just fine. why should we add robot txt ? I had a robot.txt file, but I did not like how it worked, so I DISABLED it to get back to normal. How long will it take to get back to the default condition as far as operation is concerned? It is not immediate. I See This Line About My Site. But Same Problem Please Tell Me I Enter Custom robots.txt Is Wrong? should i also add the sitemap? Thanks for your answer but I found no default setting there, robot.txt file is disabled by default. What I am supposed to do in search preferences then? Replace: MyBloggerlab.com with your domain. Hello. I'm using blogspot as my platform. I want to disallow three pages from search engine crawlers. Can you show sample I can follow in the Customs Robot.txt box?. Appreciate your response. Thank you. Just wanted to ask, how long does it take for a custom robots.txt file to show up/start working? I applied one on my blog recently but when i navigate to mysite.com/robots.txt it still shows the default robots.txt content and not the one i added. So wanted to know how long does it take for a custom file to come in effect. It takes seconds to implement. Check whether you're adding it correctly or not. my blog traffic has drop down to 10% as it was before...what to do....plz help...is there any other reasion ..plz let me know..or plz tell the errors in my robots.txt file..
And Then, It might help you out. how long it takes time to effect? It affects as soon as your site is recrawled. Hello, I am having problems with Twitter Cards and Blogger. My blog is www.bondadanonima.com. Twitter's Troubleshooting page suggests: Configure your web servers to allow Twitter access via the robots.txt file. witter uses the User-Agent of Twitterbot (with version, such as Twitterbot/1.0), which can be used to create an exception in your robots.txt file. will this affect traffic ? Like wordpress i also want robot.txt to allow blogger labels to appear in search result. How to allow label and suppose if i do this the result will be better or not. Its to mention that indexing Labels won't help in rankings. A description for this result is not available because of this site's robots.txt. for all my labels.. i dont know what is getting wrong could u help me figure out this problem. Labels doesn't provide any description in the search, this is how Blogger site works. You can't do anything about it. thanks for reply on my post. how could i get better rank in google? after submiting my blog in google webmasters im not getting any traffic from google . its 1 month now . what is the problem ? Webmaster tool just helps you index your pages in search, but to get traffic from Google you need to rank your website on keywords that are searched by people. 1. You need backlinks to get better ranking. Both looks fine, You have just changed the sitemap link. It depends on you which sitemap link you choose.